This cake is a straight forward throw-it-all-in, mix, bake and frost situation (but tastes uh-mazing). 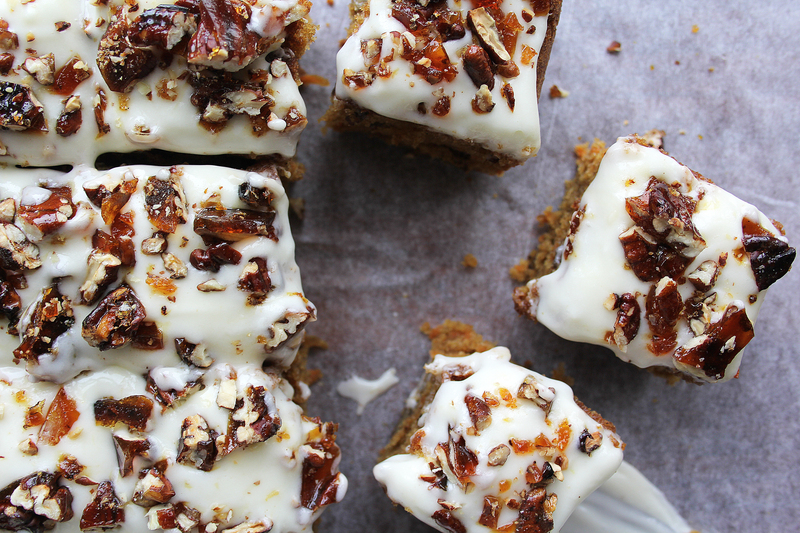 The pecan brittle is optional but I think the nutty crunch and slightly bitter caramel really adds to the spiced sponge and tangy cream cheese frosting- definitely a winner! Preheat the oven to 180c. Grease and line a square brownie tray (about 22x22cm). Place the oil, sugar, eggs and grated carrot in a large mixing bowl and briefly whisk to combine. Now sift in the flour, bicarbonate of soda, ginger, cinnamon, salt and mixed spice and beat together with a wooden spoon until smooth. Fold in the pecans. Tip this mixture into the square tin and bake for 25-35 minutes until golden brown and a skewer comes out clean when inserted. 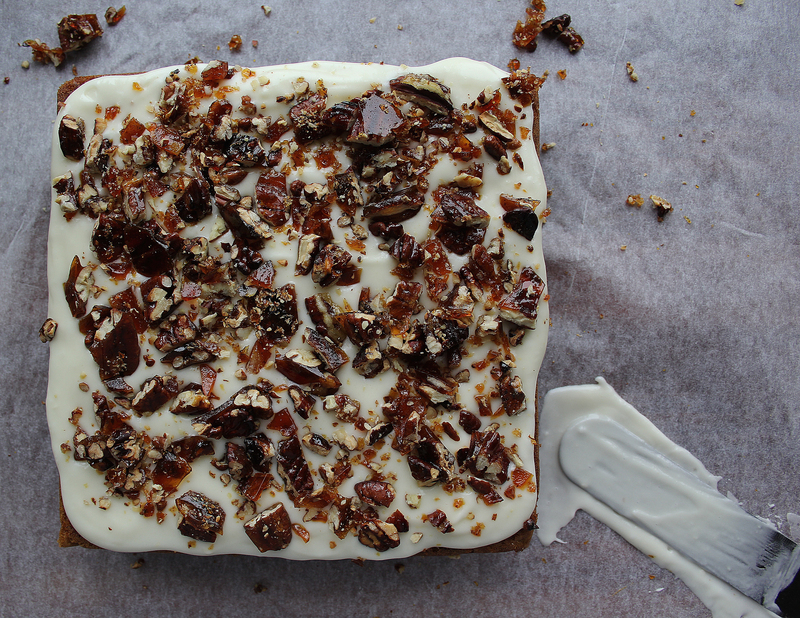 While the cake is cooking, make the brittle. To do this simply place the pecans and sugar in a heavy bottom pan and gently heat until the sugar melts (don’t stir but swirl the pan occasionally). Once the sugar has melted allow it to reach deep golden brown then pour onto a piece of greaseproof paper and allow to set hard and cool. 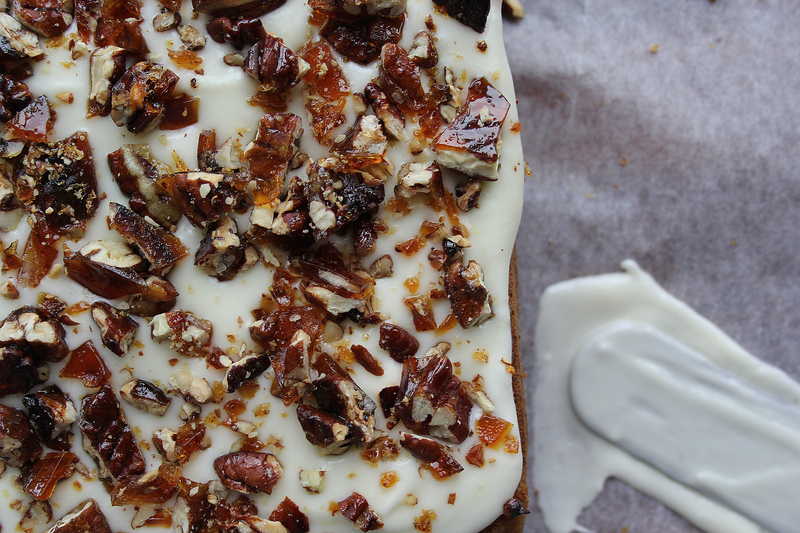 Once your cake is cooked and cooling on a rack (in the tin), make the frosting. Beat the butter until smooth then add the cream cheese and whisk until combined. Gradually pour in the icing sugar and continue to whisk for a few minutes- you should achieve light smooth consistency. Stir in the lemon zest last. Turn the cake out of the tin once it’s cooled and level off if necessary. Spread a generous layer of the cream cheese frosting all over then break up the brittle and sprinkle on. Slice up and serve (and try to resist coming back for a second piece).